Lisa Jackson showcases Apple's green innovation during the Gather Round event. 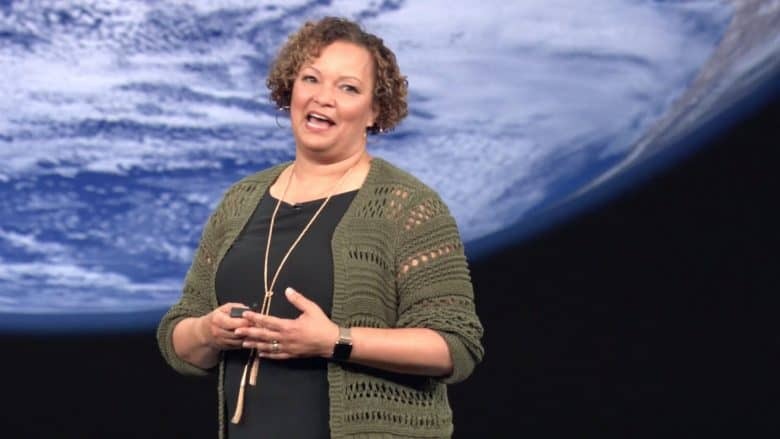 It’s an incredibly big deal that Wednesday’s Gather Round keynote featured Lisa Jackson, Apple’s head of environmental initiatives. The annual iPhone unveiling is Apple’s biggest product event of the year. Every single word and image is carefully calibrated to do one thing, and one thing only: sell as many of the new products as possible. So why did Tim Cook turn over several precious minutes to Jackson to talk about renewable energy and recycling? Because under Cook, Apple has been doing big and important work to make the company greener. Those ongoing efforts are beginning to fundamentally reshape how the company operates. UPDATE: Apple analyst Horace Dediu has a good analysis of what Apple’s environmental initiatives mean for its bottom line. Apple’s vice president of environment, policy and social initiatives then went on to talk about how the company is trying to move toward mining no new materials to make its products. To do that, Apple must achieve three things, she said. The company must use more recycled or renewable materials, make its products last longer, and do a better job of recycling them. Jackson said Apple is making progress on all three fronts. She highlighted that the new iPhone XS models use recycled tin on the main logic board. “This one change will prevent the mining of 10,000 tons of tin ore in a single year,” she said. Apple is also getting better at using recycled or bio-based plastics, she noted, pointing out that the new phones contain recycled and bio-plastic. And lastly she spoke about how Apple is making its products more durable and recyclable. Jackson talked up Apple’s GiveBack program, which takes back old devices for an Apple store credit to be resold or recycled. 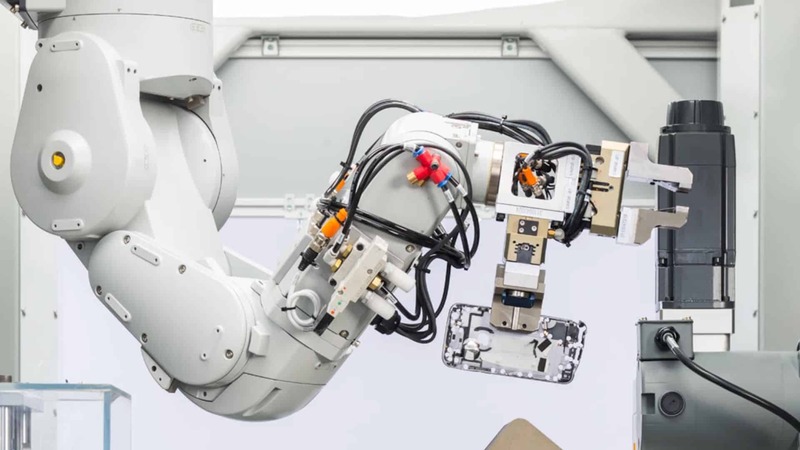 Onstage, she flashed a picture of Daisy, a prototype recycling robot that automatically disassembles nine different iPhone models and sorts the parts for recycling. Daisy can disassemble nine types of iPhone and sort the parts for recycling. It’s early days yet, but Apple hopes to use as much material from its old devices as possible to make new ones. For example, the aluminum Apple uses is of the highest grade, and recycling it could one day be cost-effective. I learned a lot about Apple’s environmental initiatives while researching my upcoming book on Tim Cook. Apple’s work in the environment is big and significant. Whereas Steve Jobs was, at best, indifferent to green initiatives, Cook is serious about making Apple a green company. That is why in 2013 he hired Jackson, the former head of the U.S. Environmental Protection Agency for four years during the Obama administration, to really juice Apple’s initiatives. Since then, Apple has been busy on a number of fronts. As well as massive investments in renewable energy, Apple is close to eliminating plastics from all its packaging. The company has more than 700,000 acres of renewable forest at its disposal, and aims for 1 million acres. Earlier this year, it announced a new low-carbon method of smelting aluminum, an energy-intensive process that hasn’t fundamentally changed in 130 years. Of course, there’s a long way to go. A whopping 77 percent of Apple’s carbon footprint is in the supply chain, which is just starting the switch to renewable energy. Apple is investing 4,000 megawatts of new clean energy in partnership with its supply chain by 2020, which will cover about a third of the current supply chain. When I interviewed Jackson at Apple Park earlier this year, she guesstimated that it will take about eight years to get the remaining two-thirds running on renewable energy. “I would expect us to continue on that kind of trajectory,” she said. The initiative is off to a good start. So far, 14 suppliers have committed to going 100 percent renewable for their Apple operations. Giving Jackson a chance to spotlight Cupertino’s green initiatives during the biggest Apple event of 2018 shows just how important environmental innovation is for Cook and the company.